Firstly, it is recognised as a classic of English literature, which is easily a good enough reason to read it. Secondly, I found it was a very good way to learn meanings of unusual and archaic words, using the built-in dictionary on my iPad, and it felt like an achievement to get used to reading prose from the early eighteenth century. Third, although the quality of the writing isn't exactly striking, there were some quite humourous passages, such as the tales of the Laputian "Projectors'" foolish experimental "Academy", which was, according to Wikipedia, the first time society's pursuit of goals through science had been satirised. I couldn't help thinking of tech start-up bubbles in the modern world — the "next world-conquering social network", World of Warcraft, Second Life and so on, and legions of hopeful investors (often) wasting money in droves. Of course, scientific research has proved to be one of mankind's greatest strengths, but Swift's absurd scientific scenarios are one of the book's highlights. Lastly, some of the ideas about government are thought-provoking, and chime with still-relevant discussions today. There is sometimes pleasure in the book's slanting approach to these ideas. Firstly, a matter (possibly) of taste, or fashion: much of the writing is unpleasantly and pointlessly scatological; I couldn't help believing Swift was probably a rather unpleasant, bitter man when his writing needed to stoop to unnecessarily filthy levels to make it's point. Second, many 'practical' problems of believability with the outlandish worlds mean much of the novel is too far removed from what an educated reader could, in my opinion, allow him or herself to imagine. None of it "rings true" in the mind, and I say this as someone who finds it relatively easy to believe in fictional stories. Compare and contrast modern science fiction writers such as Iain M. Banks, John Wyndham or the great Arthur C. Clarke, and the somewhat earlier H.G. Wells: their worlds seem far more believable, and are really beautifully described, too. If there were some purple descriptive passages or exciting drama in Gulliver's Travels, this "credulity deficit" would be more forgiveable. However, it's fascinating to ponder whether an educated reader in Swift's day would have been able to suspend disbelief and would have had a better experience by doing so. Thirdly, the narration itself is plodding and dull, with a near-complete absence of descriptive passages, dialogue, or any emotional content whatsoever. Swift has Gulliver go some way to explain this in the concluding chapter by claiming the plainness and simplicity is necessary to avoid accusations of lying against Captain Gulliver, but on this evidence it's easy to doubt that our eighteenth century churchman was capable of writing a really captivating narrative: he seems to be making a feeble and transparent excuse for the lack of colour in his writing. Yet I do feel he probably was a sensitive man (if bitter) who did feel strongly against injustice and wastefulness, and (who knows?) perhaps was tormented by the impossibility of changing things for the better. But since I know very little history of the period, the last part is pure speculation. Perhaps, in the same way that music evolves over time to become a more and more expressive medium, so does fiction, and therefore good novels are simply better nowadays. Finally, I really did wonder if there was a positive goal to the satire, or whether Swift just wanted to let off steam in a 'clever' way. It's a profoundly depressing story for anyone who likes humanity, with an atmosphere of negativity throughout. I read (Wikipedia again) that it was very popular on it's release, and obviously it still is, relatively so, all these years later. But it's so hard to make satire that is positive, and it feels clunky now compared with the sharp, hilarious incisiveness of BBC's HIGNIFY and The News Quiz, as well as Private Eye. 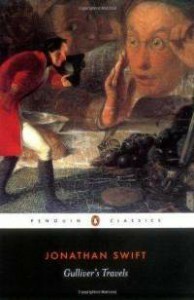 To conclude, I would advise anyone who hasn't read Gulliver's Travels to do so when they can, but it doesn't need to be at the top of your reading list unless you have a special reason for it.